In the wake of the latest UNESCO decision, Prof. Nissim Dana of the Middle Eastern Affairs Department at Ariel University discussed in an Arutz Sheva interview the early Islamic attitude towards the connection between Jerusalem and Israel and Judaism. Dana stated that he had investigated the early Islamic sources and had even published a book on the subject entitled To Whom Does This Land Belong? 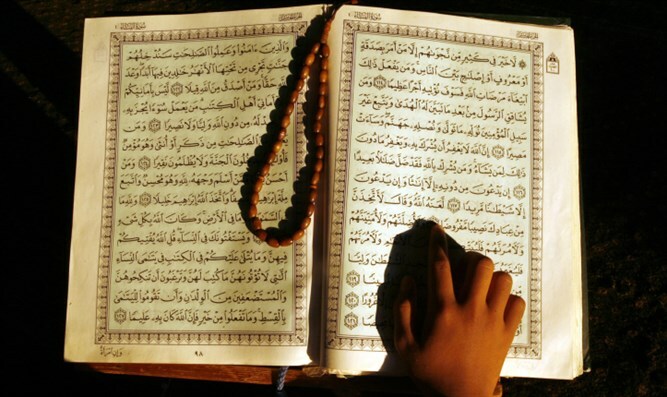 : New Insights into the Koran, revealing that Islam absolutely does not have a claim on the Land of Israel - even by its own standards - as it recognizes the Jews as the owners of this country and of Jerusalem. Nowadays, however, he explained, Muslims seem to be following the maxim 'Don't confuse us with the facts' and it is impossible to change beliefs which they have assimilated over the last few generations even by presenting them with facts from their own sources. Dana said that "Islam was born in the seventh century C.E. and the Jewish Temple existed many years before that so that it is impossible to mistake those historical facts. Hundreds of years before Islam there was a connection between Jews and Jerusalem." If Islam is aware of historical events preceding it, how can it change such things as the binding of Isaac to the 'binding of Ishmael' and create an entire festival around it? Professor Dana agrees that this is a problem, saying that "about twenty five percent of the Koran is stories culled from the Bible. Some are brought as they were written and others are ascribed to Muslims. One of these is the story of the binding of Isaac, the biblical Akeidah, which was changed and ascribed to Yishmael. Islam is not ashamed to doctor history. This is a well-known fact and on their Sacrifice Festival they talk about the binding of Ishmael and not Isaac." Prof. Dana adds that the greatest commentator of the Koran, Tabari, who died at the beginning of the eighth century, candidly stated that it was Isaac who was bound by Abraham. However the general consensus in Islam is that Ishmael was bound. Dana says that this also brings to mind the absurd expression "don't confuse me with the facts." However Prof. Dana adds that for the sake of honesty we should mention that Dr. Sari Nusseibeh, one of the heads of the Al-Quds University in Jerusalem, recognized the fact that Temple Mount originally housed the Temple before the mosques were built there. He nearly paid with his life for an article he wrote to this effect. Don't Muslims realize the linguistic connection between 'Quds' and the Hebrew word for holy, kodesh, and the expression Beit El-Muqads which is almost identical with the Hebrew term Beit Mikdash (Holy Temple)? Doesn't this testify that the holy Islamic sites are built on places which were originally holy to Jews? Prof. Dana says that "Logic would dictate that this is indeed the case but they are not concerned with the facts which contradict the widespread Islamic belief that they were here and we threw them out, claiming that we threw out earlier nations like the Canaanites who were Arabs. They see themselves as descendants of the Canaanites." This is, of course, impossible as the Canaanites were pagan idol worshipers who disappeared centuries before Islam arose and the Arab hordes swept out of the Arabian Peninsula in the 7th century CE to conquer the Holy Land of Israel.